Jefferson County is located in northwestern Washington on the Olympic Peninsula. Its western edge borders the Pacific Ocean and its northeastern point extends into the Strait of Juan de Fuca, Hood Canal, and Puget Sound. The center of the county is taken up completely by the Olympic National Forest and Park, including the west peak of Mount Olympus, and is uninhabited. The majority of Jefferson County’s towns lie in the northeastern corner near Port Townsend; the total population is about 30,000 people. Port Townsend is the county’s largest and only incorporated city. Nearby communities include Port Ludlow, Port Hadlock-Irondale, Indian and Marrowstone Islands, Chimacum, and Quilcene. This area is connected to the Kitsap Peninsula by the Hood Canal Bridge. Nearby Whidbey Island is accessible by ferry. There are very few towns on the county’s west coast, only the tiny community of Queets in the Quinault Reservation, since the rest is almost entirely protected wildlife land. 3 Beds | 3 Baths | 3135 sq. Ft.
3 Beds | 1.75 Baths | 1269 sq. Ft.
3 Beds | 2.5 Baths | 2160 sq. Ft.
2 Beds | 2.5 Baths | 3594 sq. Ft.
3 Beds | 1.75 Baths | 1482 sq. Ft.
2 Beds | 2 Baths | 2140 sq. Ft.
Blue Summit Realty has the most accurate and up to date Jefferson County real estate listings on the web. Currently there are 110 homes for sale, 6 condos for sale, 5 rental properties, and 275 vacant land properties in Jefferson County. Of the 397 total Jefferson County residential listings for sale 2 are bank owned, 1 are short sales and 11 are new construction and 0 are townhomes. The price ranges from $38,000 to $2,750,000 with a median list price of $443,225 and median sold price of $387,863. 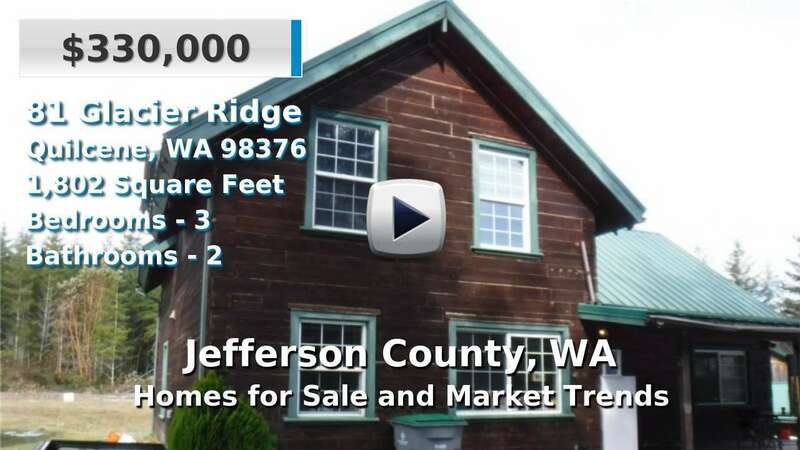 Make sure to refine your Jefferson County real estate search by property type, price, square footage, bedrooms, bathrooms and more with the search tool above or view the Jefferson County listings on our interactive map. Our Jefferson County real estate listings were updated 5 minutes ago.